Balloon flight planning is easy. Here are some tips about planning, health & safety, photography, food service, and facilities. Comfortable, casual clothing is always recommended on all our tours, since we are enjoying nature in the desert environment. Temperature in the balloon is about the same as on the ground. Please dress appropriately for the day’s anticipated temperature. During the winter months, a jacket may be necessary. Closed toe shoes should be worn. A hat and sunglasses are recommended but not required. Heat from the balloons burners can be felt on your head and shoulders. Therefore, tank-tops and sleeveless shirts should be avoided. As in all outdoor activities in the desert, sunscreen should be applied. Your hot air balloon flight provides many opportunities for excellent photographs and videos of the flowers and fauna. Be sure to bring your camera and pack plenty of film and fresh batteries. Our ground crew and pilots are happy to take your picture, using your camera, in the balloon both before take-off and in the air. Please be sure all photo equipment is properly protected in a padded case and stowed away for landing. We can not be responsible for damage. In order to participate in a hot air balloon flight, you should be in good general health and not be pregnant. Landing can sometimes be bumpy, similar to jumping off the second or third rung of a ladder. You will be required to sign a medical statement of good health and a waiver of liability prior to your flight. Our launch and landing sites vary from day to day dependent upon the winds. At our Deer Valley Airport meeting site has a restaurant. You can use the restrooms and pick up a coffee or a quick meal. **Please note** We can not wait. So leave plenty of time before your flight time to use these amenities We are typically in remote parts of the desert. While there are usually abundant trees and bushes, there are no restroom facilities. We are well known for our outstanding food service. Our menu is pre-selected and can not be found on our brochure, Vegetarian meals are available with 24 hour advance notice. 48-Hour notice is REQUIRED to cancel your reservation without penalty. If you cancel less than 48 hour, No-Shows, or show up with fewer passengers than reserved, your credit card will be charged for the full amount. We know sometimes life happens. If it does, We will issue you a Gift Certificate for the charge that is good for six months! However they are fully transferable and/or you can sell them and they will be honored. If you are celebrating a Birthday or Anniversary, please advise us when you book your reservation. We’ll plan a special celebration just for you! 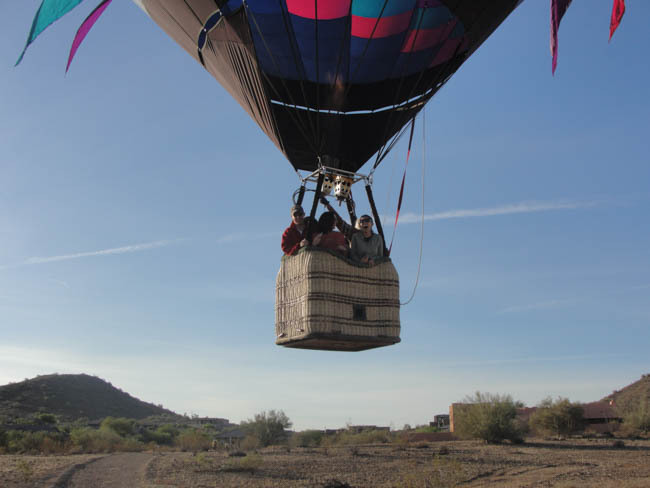 You can put your trust in Arizona Hot Air Balloons. We provide personal service and exceptional quality. All of our services and products are guaranteed. As one of the oldest names in the Ballooning industry. Our unparalleled service, competitive prices, and overall value are why our loyal customers won’t go anywhere else. We look forward to serving you! 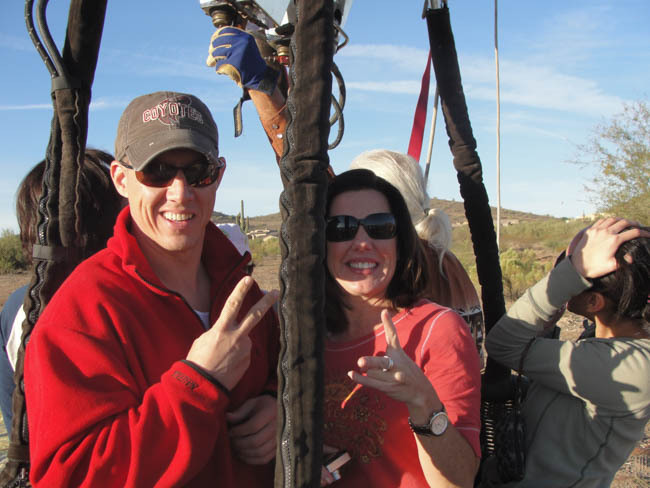 Fill out our small Phoenix Arizona Balloon Ride inquiry form or call us at 480-282-8686 and our friendly staff will answer any questions you may have about our balloon excursions.